Today I read Bring up the Bodies by Hilary Mantel. This book tells Cromwell’s side of the downfall of Anne Boleyn. Together with him we live the day that lead to her execution. 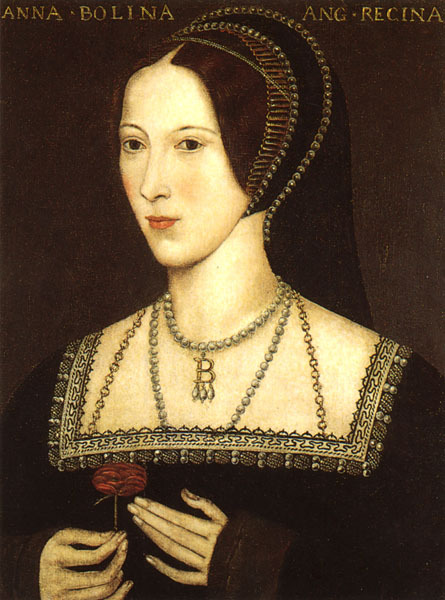 I’m just curious… Anne Boleyn tore a kingdom apart, she managed to get a queen out forever, to cut the bond between England and Rome, and to be the first queen who was ever executed. That’s quite much for a young woman. Seven years she has been working her way to the top. With her French past (she was a maid of honour there) and her pleasant character she was said to be ‘exotic’, though apparently she also had a bad temper. When she came at court to serve the queen, she quickly got some admirers since she was seen as the most stylish and accomplished woman there. Then she caught the king’s attention, and there we go. For seven years she seems to have refused to become his mistress, she resisted his seduce attempts. That may have been what kept him going for her… I guess she was one of the few women to do that. Eventually, Anne became a queen, but that success only lasted for three years. May the 19th, 1536 – Anne’s been beheaded. It was probably the lack of male heir she promised to give the king which opened up the path to downfall. We’ll never know for sure what happened and how it happened. I find it so interesting to read about her. How did she do that? How could she become so important? That’s so intruiging. Some people just seem to have A Thing that makes them irresistible. Much like Cleopatra, who managed to seduce the two most important men of Rome at the time. Accounts say that she wasn’t pretty… But still she was so powerful and attractive. I guess it’s not so much about looks, but more about a strong desire for power and the ability to charm people. I suspect that such abilites are something you are either born with or not. Of course you can learn how to do small talk, but to be able to get everyone at your feet, that must be something inside you that’s always been there. I think. By the way, in the clips I have found on YouTube from the movie The Other Boleyn Girl, Anne is almost always crying. I cannot imagine a woman who has been fighting for seven years to be queen weeping all the time. While The Tudors Anne had stronger nerves and more dignity. I believe that that is way closer to the truth. You cannot get where she got when you’re emotionally so vulnerable. You might know that I’m a great magazine fan and that I can’t throw them away, so I’m stuck with loads of magazines, all piled up, but not useless! Whenever school demanded a creative approach for something, I dived into the world of fashion photography and publicity, to come out again with a very creative thing I could be proud of. So when we had to make a cover for the topicality task (I call it that, because I don’t think there is any good translation. this is a google translate product. we had to find items about a certain subject, very serious subjects like ‘challenges for Europe’, that is what I try to say. I’ll keep using this word, but please tell me which one woul fit better.) and we were allowed to be creative, I took a handful of magazines and started to search. Normally, I only use fashion magazines, because they have such beautiful pictures and nice publicity. But now I also used a sensation-seeking magazine, you know, the kind that has headings like ‘PRINCESS KATE MAD AT PARTY ANIMAL PIPPA’. They are keen on drama and sad stories and relations going wrong. My grandmother buys such magazines for the TV-guide within, and then gives them to us. They can be fun to read sometimes, because they have the ability to push you into a certain direction. It’s so subjective, and they succeed in making you think certain things. For a woman who expects us to explain everything about the Vietnam war, I find that rather strange. Now I was really pissed. Overall there is a great difference between a sensation seeking magazine and a fashion magazine. You might consider fashion magazines to be rather superficial, but I consider fashion photography to be a sort of art. It is a bit superficial, but next to the ‘what to wear’ parts they also talk about society stuff, about politics and art. Not in a way a serious newspaper would do perhaps, but still. Do not – ever – tell me they are the same. And how come you don’t know? I thought. How can you be so cut off of the world? How can you know so much about the Cold War and yet get uncomfortable when being confronted with a heading saying ”Jeanstrends – Four times in denim’ ? Because she was looking quite uncomfortable. Then I realised that it was a world she just doesn’t know anything about. The magazine world is unknown to her, and that is why she had put the annoying question mark there – to feel comfortable again. Question marks are her world. But she had opened the folder and started talking about the items. Seriously, I thought, this is how Galileo must have felt. Sort of. People, sometimes, just don’t understand you. And often you cannot make them understand. After fifteen years of hard work, dedication and a standard half-comatose condition, a teacher we have finds it necessary to tell us how we should study. After all those years of learning, after all those tests that made us end up at that school, after which we have to go to university to be able to get a job, we can’t study. We got a document, telling us what we should do, how we should do it etcetera. And while reading it, I could only think I’m doing it wrong. I’m doing it wrong, people. There is a great chance that later, they’ll have to pay me per minute, but I’m not doing it right. Instead of reading my lessons all over when coming home from school, I’m blogging. Instead of reading things out loud, I sing along with (great) songs. Instead of studying the way I should, I’m having something that resembles to A Life. Imagine. A Life! While going to school! Imagine. Can’t be. But unlike some history teachers, I seem to live in the Now. I didn’t know it, until – eh – now. I’m sorry if it bothers you that I use my marker, or that I write my notes somehow different than you do, but it seems to work for me, so I’m not really sorry at all. AT ALL. Thanks for the tips and now shut up because there are two (maybe three!) people waiting for a post on this very blog. And that’s what I’m doing now, and I’m doing it right.